At the January Cheshire Best Kept Station awards we were pleased to see two of our Mid Cheshire Line stations winning awards. 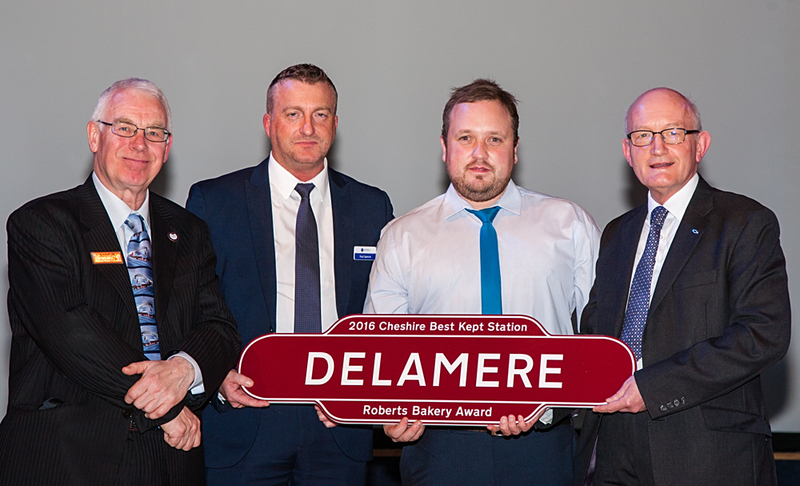 Delamere won the Roberts Bakery Award for Most Improved Station and Chester won the Queen's 90th Birthday Award. Chester received the award for the station event organised to celebrate the Queen’s birthday. An event with stalls and displays on the station concourse provided by the Chester Samaritans, the Ffestiniog Railway, Chester Model Railway Club, Mersey Morris Men, Friends of Mills Hill, Arriva Trains Wales, North Cheshire Rail User Group and of course Mid Cheshire Community Rail Partnership. Delamere station gardens are looked after by students from Petty Pool College who learn about gardening in the class room then practice their gardening skills at the station, they also collect litter and are responsible for the artwork in the Manchester bound shelter. Knutsford Station staff also got ‘Highly Commended’ for their afternoon tea celebrating the Queen’s Birthday. Stations are key gateways in and out of communities and are shop windows for an area so the work that volunteers do gardening and organising station events makes a huge difference – THANK YOU to ALL who get involved in community rail along the Mid Cheshire Line and beyond. And congratulations to Chester, Delamere, Knutsford and all the other stations who won a Cheshire Best Kept Station award.